Maybe the scope of Cyberpunk 2077 seems limited compared to The Witcher 3. Developer CD Projekt Red is going from several sprawling regions of a fantasy continent to a single near-future city, and the switch to a first-person perspective certainly seems to favor smaller, denser spaces. 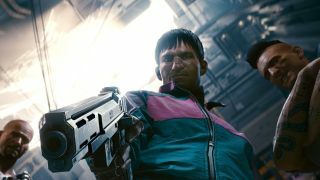 But however it works out on a square-mile basis (not to mention all those skyscrapers), Cyberpunk 2077's mission ambitions are just as grand as its predecessor, according to a new interview with quest designer Patrick Mills published on Metro. "I can’t talk about numbers but I’d look at Witcher 3," Mills said when asked about how many quests will appear in Cyberpunk 2077 in total. "Something like Witcher 3 is what we’re aiming for." Normally you expect developers to answer pretty much any quantitative question about their new game with some variation of "even more than the last game!" But with more than 400 quests in total (by Twinfinite's accounting) appearing in The Witcher 3 - and the game famously taking hundreds of hours to 100-percent complete - any more than that just sounds excessive for Cyberpunk 2077. And where the hell does it all come from? The main quest speaks for itself in most games, weaving you through all the main locations and activities the developers want to highlight. Mills explained how CD Projekt Red has a particular way of filling out the rest of the game with stories off the beaten path. "The way that we develop side quests is very often by looking at the main story; after we’ve written out and sketched out the main story we find the characters that maybe we want to spend more time with, themes, or even bits of old main story that aren’t getting used anymore," Miller said. "And because there’s not the pressure of being part of a multi-hour long story you have a little bit more freedom to figure it out. And for us, our rule for side quests is that the story has to be something that you’ve never seen before, there’s gotta be something in this story that’s different." Speaking of Geralt-related affairs, see what the Witcher 3 can tell us about when Cyberpunk 2077 will actually come out.